Economy Wrist Support. 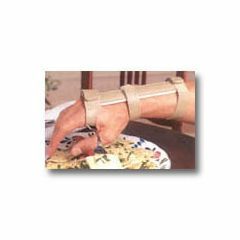 Leather-covered metal splints. Hand cuff is leather with hook and loop closure, and the pocket angle is permanently fixed. Fork not included. Latex free.